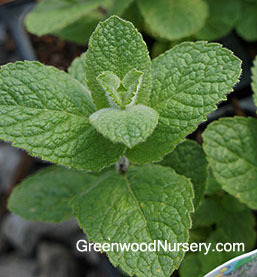 Apple Mint will delight your taste buds with its fruity tasting light green leaves. Use your Apple Mint leaves in salads, teas, jelly or use throughout the spring and summer seasons as a garnish for dishes and drinks such as lemonade for added fragrance. As with most mentha plants, you will want to plant your Apple Mints in containers (full sun to part shade) to keep the plants from growing every where. In areas where it can grow without care, Apple Mint and other mints can be used as seasonal ground cover. Harvest the leaves for mint tea. Your Apple Mint will attract bees and butterflies when it explodes with its white to pale pink flowers in mid-summer. Grows in zones 4 to 9 maturing in the 1 to 2 foot tall range. Apple Mint ships in 3.5 inch pots. Plants shipping to CA or AZ will be root washed and wrapped before packaging.